Asphalt pavement is one of America’s most recycled products. Recycled asphalt pavement (RAP) can be of extremely high quality containing Class 1 aggregates as well as oxidized asphalt. Recovering these resources can be extremely valuable to the taxpayer. Recycling and reusing this valuable resource can significantly reduce the cost of a ton of hot mix, but the oxidized asphalt in RAP has a stiffening effect on the mix. Excessive quantities of a stiff binder can lead to reduced pavement flexibility, early cracking and premature failure. Revive rejuvenators have a high solvency for the old, aged and oxidized asphalt. This means a very high percentage of the RAP binder will be quickly accessed and brought into the binder / mastic continuum. 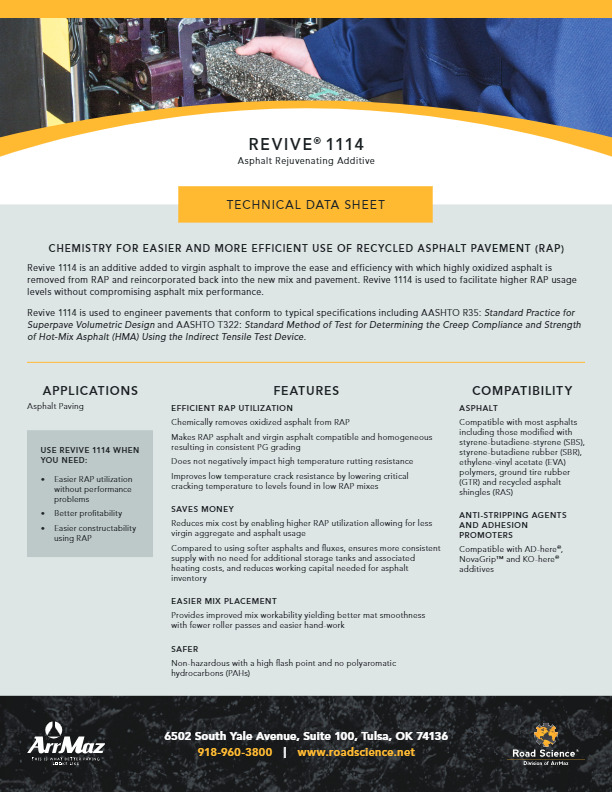 Revive rejuvenators reduce the complex shear modulus of the resulting RAP-Virgin asphalt binder mixture. This combination reduces the risk of undesired performance and enables profitable use of more RAP. Adding an additional 20% RAP to a 15% RAP mix will allow you to reduce your virgin binder demand by almost 40%. With Road Science’s Revive rejuvenators, these results can be effectively achieved without compromising the quality and long-term durability of the mix.